“More music is on the way”, Paul says. The first part of the Q&A with Paul was posted on a-ha.com today. 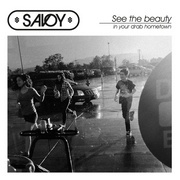 Moreover, Paul mentions that he’s working on two additional albums, and that he’s hoping to include the song used in last year’s Scent of a Woman trailer on the next Savoy album. 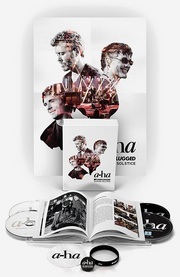 Please visit a-ha.com to read the full Q&A. 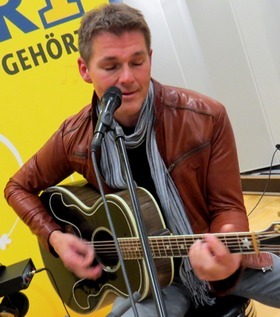 Morten was in Hannover today, on the fifth day of his German promo tour for the upcoming Brother album. On the radio station FFN another contest winner, Bettina, had the chance to get vocal coaching from Morten as she sang a duet with him on “Brother”. Two different video reports from the visit have been posted on ffn.de and sat1regional.de. He was also interviewed for several FFN shows, and there are extensive photo galleries on haz.de and ffn.de. While at the radio studio he also met this fan. 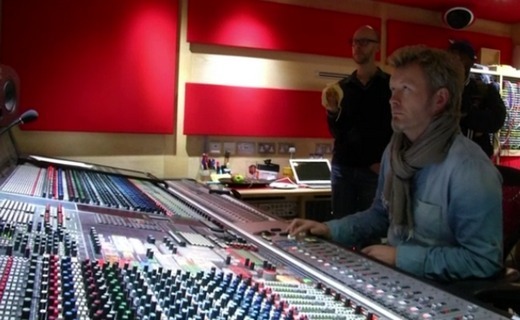 Morten also visited the studio of HR1 for more interviews. The HR1 website has posted a video clip of Morten speaking in German, inviting people to come to his concert in Offenbach in May. There is also a photo gallery. And here’s another Instagram photo from the visit to Baden-Baden on Wednesday. 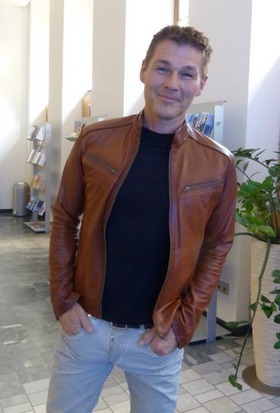 Morten continued his promotional tour of Germany today. In Mainz he visited the studios of SWR1 Rheinland-Pfalz, where he was interviewed for two different shows. He also did another acoustic session together with Dan Sunhordvik. 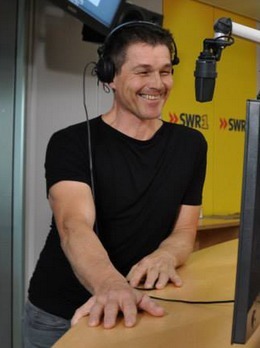 A photo gallery and a few interview clips have been posted on swr.de. In Ludwigshafen he was interviewed by RPR1, where a lucky contest winner had the chance to ask him some questions. 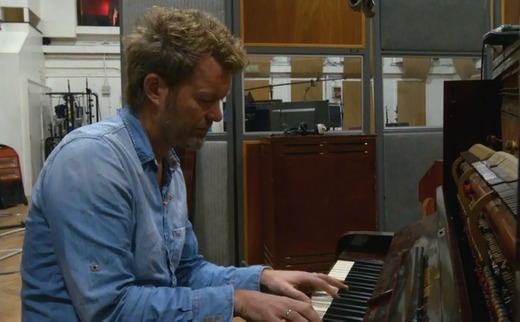 She asked if he’s going to play more solo songs on this tour, instead of a-ha songs, to which he replied: “More of me”. A picture with RPR1 host Inge Meyer has been posted on Facebook. He also visited Radio Regenbogen in Mannheim, where he was met by a group of fans. A photo gallery can be found at regenbogen.de. Update: A video clip from the interview has been posted on YouTube. As for why “Did I Leave You Behind” was left off the album, Morten has told a German fan that it was because they only wanted to have 10 songs on the album, and it didn’t quite fit in with the others. Two additional interviews with Morten were broadcast on German radio today. The 5-part interview can be heard on Radio 7’s website. The full interview doesn’t seem to available online, but another acoustic performance will be broadcast on SWR1 tomorrow night. 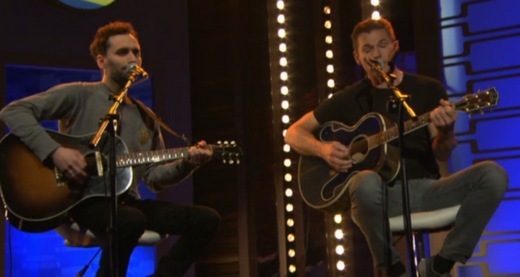 Morten and Dan also did an acoustic version of “Brother” on the TV-show SWR3 Latenight in Baden-Baden today. Some Instagram pictures have been posted here and here. 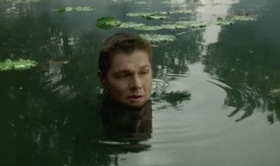 When it will air remains to be seen. Magne attended the funeral of Kjell Nupen (1955 – 2014) in Kristiansand today. Nupen, who died from cancer on March 12th, was one of Norway’s most famous contemporary artists. He was Magne’s artistic mentor from 1989 – 1993 and they held several exhibitions together. 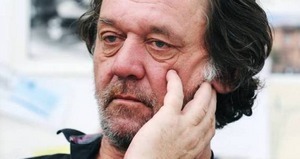 “Norway has lost one of its greatest visual artists and a unique personality. Kjell was a great figure in every way, and leaves a gaping void that will be impossible to fill. 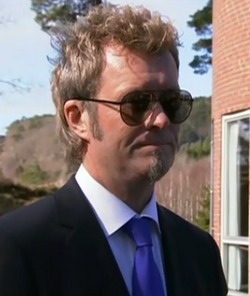 Everything I know about graphic art I’ve learnt from him”, Magne said in his speech during the ceremony. “Kjell. I miss you and it hurts so much. There’s so much more we should have talked about. I am grateful for the time we had together”, Magne said. The funeral ceremony was held in Søm Church, a church decorated by Nupen himself. 700 people attended the funeral, including King Harald and Queen Sonja. 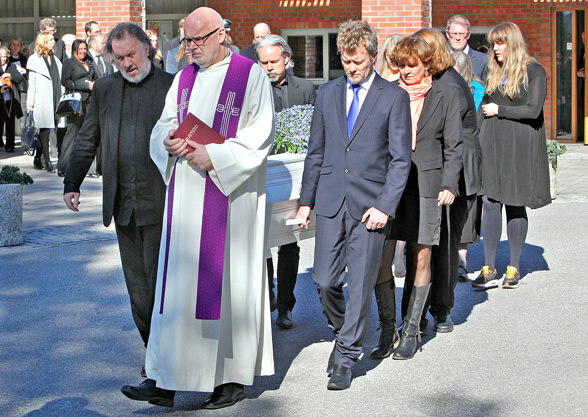 Magne carried the coffin together with Bjørn Eidsvåg and Ole Larsen (VG photo). 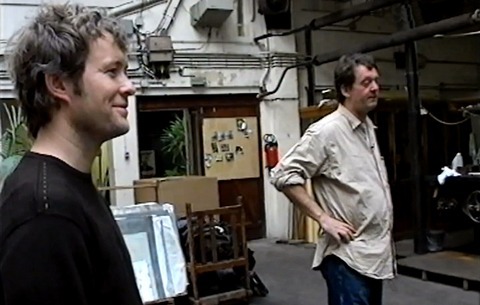 Magne and Kjell Nupen, working together in Paris in 2002. A second festival concert in the county of Nordland was announced today; Morten is performing at Verketfestivalen 2014 in Mo i Rana on 29 August. Tickets are available now through Billettservice. 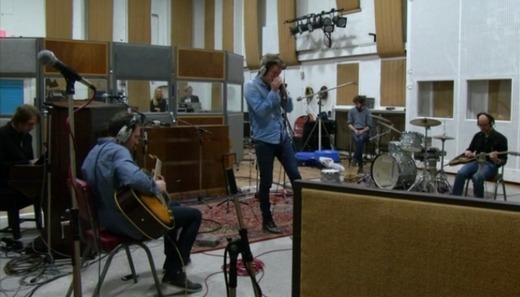 In other news, Morten’s Studio 1 concert special will air earlier than first announced. It premieres on NRK1, Saturday April 5th at 22:35. The “Brother” music video, which leaked online earlier this week, had its official premiere on VGTV in Norway today. 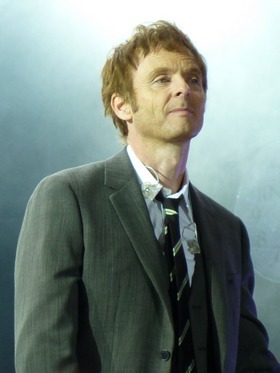 “Harald Zwart got the idea for the music video immediately after hearing the song for the first time. 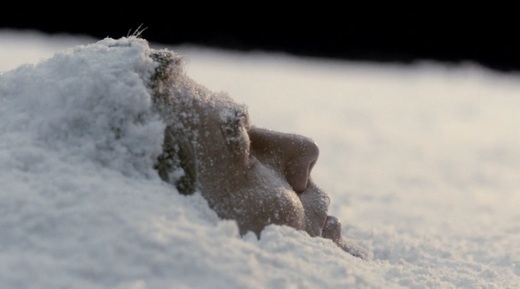 It’s based on a classic movie by the Swedish comedians Hasse & Tage. We have arranged for a copy of the video to be delivered to the Hasse & Tage museum”, Morten tells VG. “It was developed from there and to its final version by Peter and myself. The lyrical identity came to me – at the same time – after having just read the biography of Majiid Nawaz, “Radical”, about growing up as a young muslim in England, faced with European, Western culture and politics, and his personal confrontation with fundamental values after years of going down an uncompromising and dangerous road internationally as an islamist. And then choosing an even more dangerous road later on”, Morten says. “Brother” is about love and respect, as it is shown when recognizing everyone’s right to become who they are. About the right to follow your own conscience. “Brother” is about respecting diversity – and how this is a fundamental value”. Yet another Norwegian summer concert was announced today. Morten will perform at the third annual Nerskog concert, held at Grovasetra in Rennebu, on 30 August. Update: Tickets are now available on Billettservice.no. Although the “Brother” music video hasn’t officially premiered yet, it has now started appearing on YouTube. Apparently the video was posted prematurely on Vimeo by someone involved in the production, but has since been removed. The same thing happened with the video for “I’m The One”. The music video was shot in Ernest E. Debs Regional Park in Los Angeles last month, and directed by Harald Zwart. 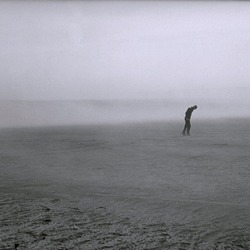 The song itself is a heavily shortened edit version. Linnea Dale’s upcoming second solo album is now scheduled for release in May, according to Aftenposten. It will include 3 songs written by Paul. Last night, Linnea took part in the first Eurovision semi-final with the song High Hopes (not written by Paul), which got her qualified for next week’s final in Oslo Spektrum. Update (14/3): The album release has been moved forward to April 25th, according to a Warner Music press release. The 11-track album is called Good Goodbyes and has been produced by Kim Edward Bergseth and Paul Waaktaar-Savoy. 30-second audio samples of all the songs on Morten’s new album Brother are now available on Amazon. Listen to them here. Update: 90-second samples in better quality are now up on iTunes UK, Ireland etc. If you can’t find them in your local iTunes Store, just change the country. Another festival concert was announced today: Morten will perform at the Hvalstrand Festival 2014 in Asker, which is held on 22-23 August. The exact date for the concert is not yet known. Update: It’s 23 August. “Morten Harket will finally perform in his home town, and we are very proud that he’s chosen our festival!”, festival manager Fredrik Brodtkorb says. 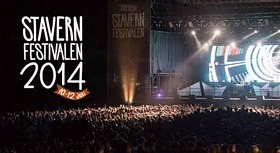 Other artists confirmed for the festival include Sivert Høyem, Melissa Horn and Alphaville. For a list of all the 2014 concerts announced so far, click here. 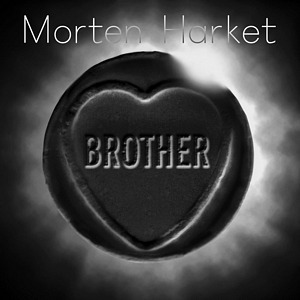 Morten’s upcoming album Brother, to be released on April 11th, is now available for pre-order through Amazon.co.uk and Amazon.de. For some reason “Did I Leave You Behind”, which Morten performed at every Night of the Proms concert, will not be included. The final album cover doesn’t seem to be ready yet. So for now, the Amazon listings just include a combination of the “Brother” and “There is a Place” single covers. Update: The cover art is now confirmed to be official, which is pretty shocking, considering how poor it looks. Was there no money left to hire a graphic designer?